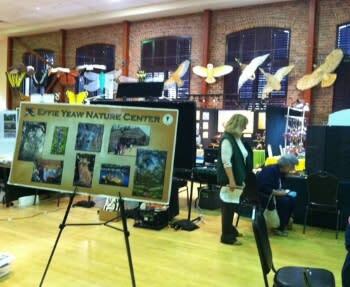 Last year, our Hometown Tourists Visited the annual Sandhill Crane Festival in Lodi. Here&apos;s a recap of their visit just in time for you to plan your visit to the 2017 festival in November. Each year in October we look to the sky and wait with anticipation to hear their distinctive clattering call. For many years, my husband John and I talked about attending Lodi’s annual Sandhill Crane Festival. It’s only about an hour’s drive from Sacramento. Last year, on the first weekend in November, we actually made the trip, and invited Jackie to join us. It was a lot of fun! Call can be heard a mile away. Have up to 7 foot wingspan. Can live up to 50 years. Eat corn, wheat, insects, worms, and mice. Sleep standing up in shallow water. Dance and wave twigs or feathers when they’re happy. We learned all this, and more, at the 2016 Lodi Sandhill Crane Festival. 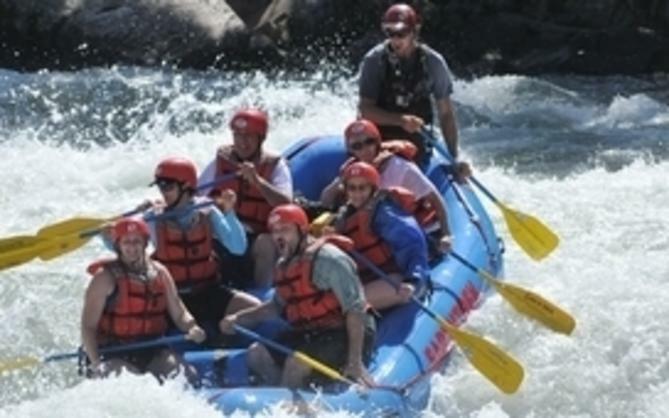 This was really interesting, and so much fun! 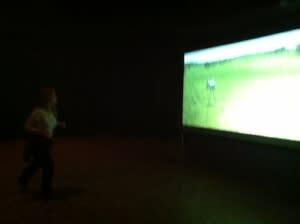 Entering a large darkened room, we found a big screen depicting a meadow. When a person stepped in front of the screen, an image of a crane appeared. The on-screen crane would do whatever the person did. When Jackie and I had our turn in front of the screen, two cranes appeared in the meadow. If we raised our arms, the cranes raised their wings. If either of us stood on one leg, so did “our” crane. If we turned around, the cranes did the same. When one of us moved out of sensor range, her crane flew out of the meadow! It was really cool! 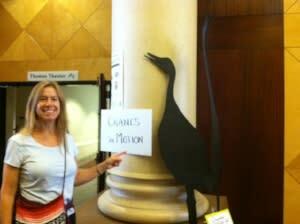 We thoroughly enjoyed our time “virtually” dancing with cranes. I should add this presentation came with a stern warning “Don’t try this with real cranes.” It could be dangerous to all involved! A crane we did get to approach as we left the Cranes In Motion theater was the Crane Festival mascot. Of course we had to have our picture taken with her! 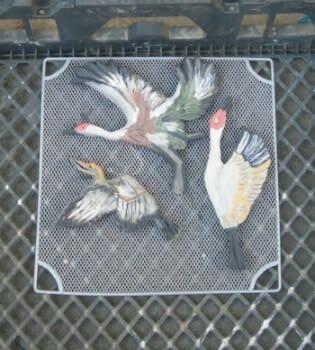 On the sunny back patio we saw people gathered around a long table, intently carving crane images from clay. T-shirts from all 19 Crane Festivals made a unique celebratory banner. Each person became an artist, interpreting their clay crane in a beautifully distinctive manner. 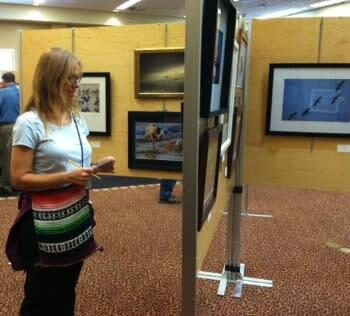 We spent time viewing the wildlife art show associated with the Sandhill Crane Festival. We even got to vote for our favorites of the photography, paintings, and sculptures on display. Outside the art show gallery, student volunteers assisted festival participants in folding brightly colored paper into origami cranes. Jackie and I found adjoining vacant seats. 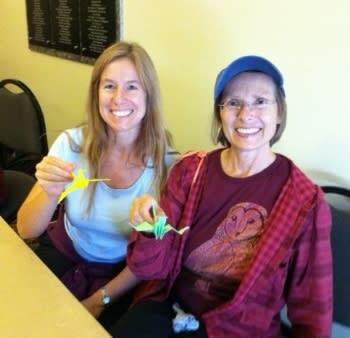 With focused concentration and diligent attention to our docent we were able to make small paper cranes. When we arrived, it was lunch time. In the vendor area, we bought turkey sandwiches with chips and a drink, then found a place on the sunny back patio to enjoy our lunch. Returning to the vendor area, we viewed and visited tables and booths representing different organizations. 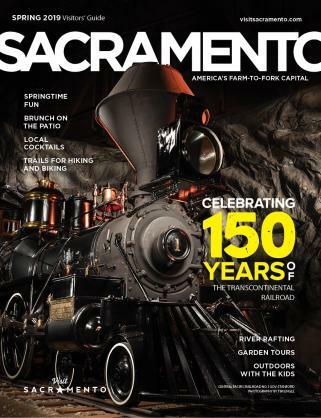 Some were familiar to us as such as the Effie Yeaw Nature Area and The Consumnes River Preserve in Sacramento County. 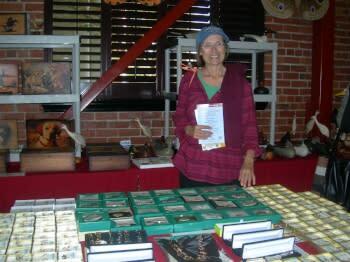 Others we’d heard of but never ‘met’ before, such as California Native Plant Society. We sampled wild elderberry jelly at CNPS’s table and picked up a reminder postcard for Native Plant Month events we’ll want to check out later. 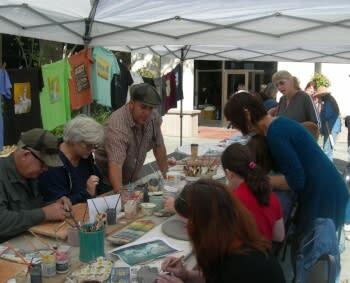 Other booths and tables featured items for sale such as sparkly jewelry, silkscreen shirts with wildlife images, carved wooden ducks and shorebirds. Along with the other festival attendees, Jackie, John, and I browsed among bird books, photography, binoculars, spotting scopes, hats and all kinds of bird related items. Besides the wide array of neat stuff to look at and purchase, we found ourselves in conversation with many interesting people. Of course, because they are bird-watchers, too! 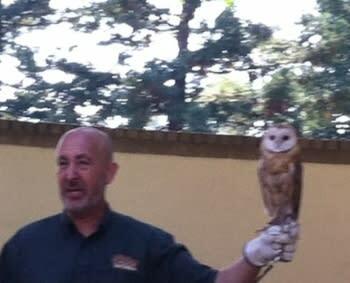 At one particular table, a beautiful maroon t-shirt with an image of a barn owl caught my eye. Emily of Craft and Quail creates a line of wildlife-image items, through a fascinating process that removes the dye instead of adding it. This way, she can place a light-colored image on a dark-toned t-shirt. 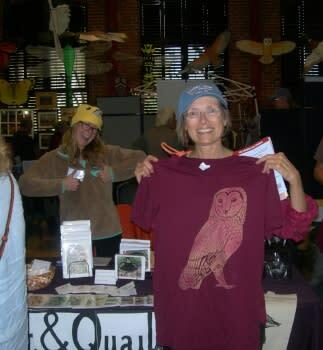 The barn-owl t-shirt is my new favorite! We’d preselected two presentations from the Festival program that we wanted to see for sure. 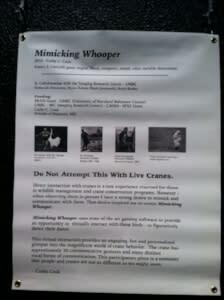 The first, held on the shady side patio, was titled Wild Things. Gabe Kerschner, of Wild Things Inc. in Weimar, CA, gave a lively and informative presentation featuring animals rescued from the illegal pet trade. Gabe’s main message: it would be better if all of these animals were still able to live in the wild. So true! The talk and the chance to see a kinkajou, a lemur, a barn owl, and an alligator up close were well-received and enjoyed by children and adults alike. 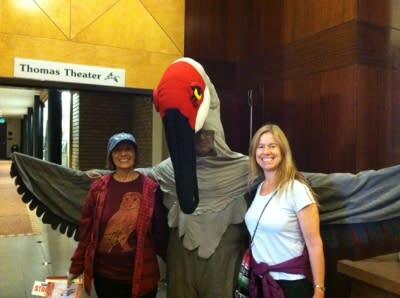 Right after Wild Things, we attended a lecture and video presentation on The Private Lives of Sandhill Cranes. Paul Tebbel previously managed a sandhill crane sanctuary along the Platte River in Nebraska. The most amazing thing was the video clip of cranes throwing rocks at him! Fascinating as Tebble’s lecture was, we ducked out during the Q & A session so we could head out to the Marilyn and Phil Isenberg Sandhill Crane Ecological Reserve on Woodbridge Road. 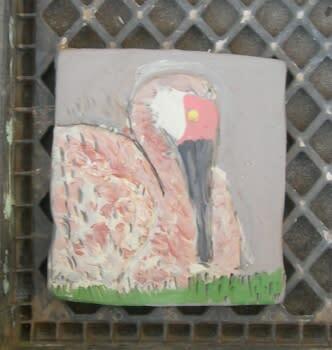 We wanted to show Jackie the experience called “Sandhill Crane evening fly-in." 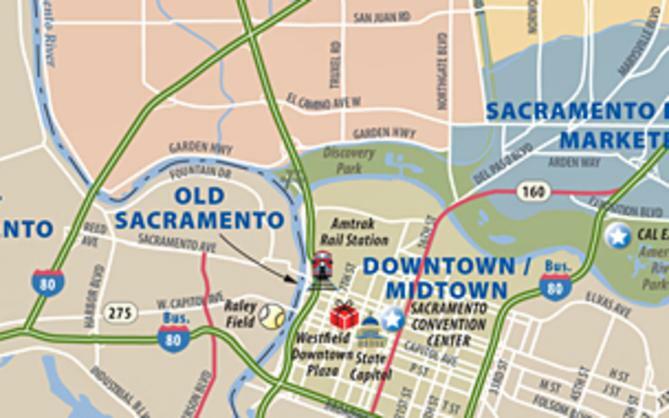 The reserve is named for Phil Isenberg, who was Mayor of Sacramento from 1968 – 1975, and his wife Marilyn. After parking with our headlights pointed away from the marsh, we admired Mt. Diablo to the west as people gathered. Jackie and I wandered about and viewed the informational signs. 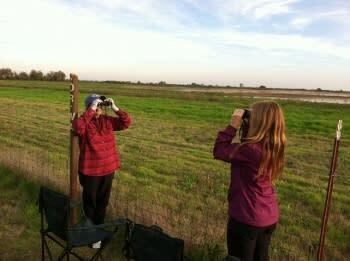 John scanned the horizon with binoculars and reported crane sightings. We reviewed our photos and compared notes on our favorite activities of the day. Two large tour buses from the Crane Festival arrived. Geese flew over, and some ducks landed. The suspense built. People brought out their cameras and spotting scopes. Shorebirds and coots provided sound and entertainment. The sky and clouds turned beautiful colors as dusk came on. We saw some Sandhills flying -- would they land here? 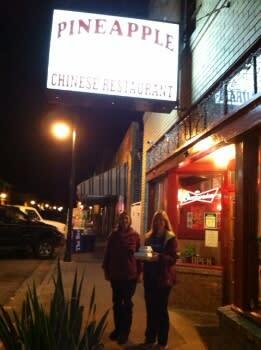 As the evening fell around us, we got back in the car and took a 20 minute drive to Isleton for dinner at The Pineapple Chinese restaurant, one of John & my favorite places in the Delta towns. Their shrimp egg foo yung and their Mongolian shrimp with green beans are both fabulous! Next Year – or Sooner! 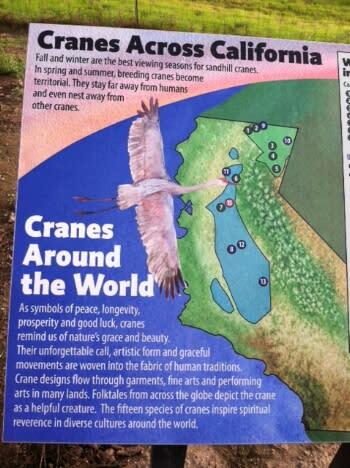 The good news is you don&apos;t have to wait a whole year to experience Sandhill Cranes. They winter here and will be in our area until March. You can go to the Consumnes River Preserve (near Thornton) south of the intersection of Twin Cities Rd. and Franklin Boulevard. 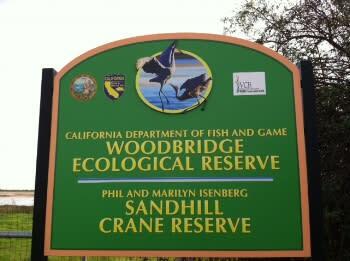 Or you can go to Woodbridge and enjoy wild sandhill cranes. We are lucky to have the sandhill cranes to enjoy in our nearby marshes and wildlife habitat. Plan now to attend the 2017 Sandhill Crane Festival in Lodi. We are!